So you've got an Eco-Charge that you haven't used in a while, or maybe you've drained it and it just won't take a charge. This happened to me recently - left my gear plugged in after a show and it drained my BP-50 to the point of no return. These things cost $80 new if you can get them. 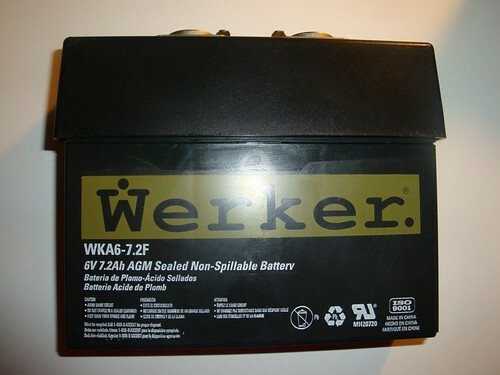 Fortunately, the construction is pretty simple - all you need is a replacement battery (the one here is a Werker WKA6-7.2F, $21.99 at the local Batteries Plus) and a screwdriver or other prying tool. This will likely also work for the old GP-90's, but probably NOT for the new EC-90's as they've got more circuitry inside (some of which is designed to prevent deep discharges like this anyway!). But I digress. 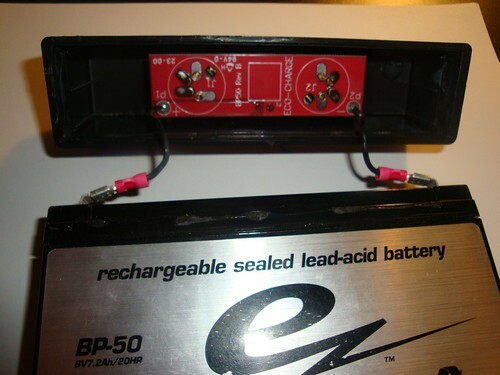 The dead Eco-Charge BP-50. Note the little lip on the top part. Stick your prying tool underneath that lip. 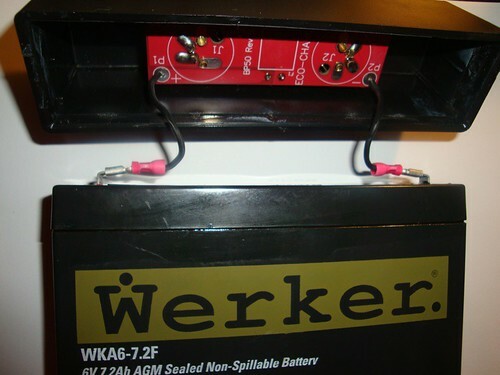 Not perpendicular to the battery itself (there's also a groove that separates the body of the battery from the top) but parallel to the face of the battery, between the battery and the top housing. There's a weak adhesive holding it in place; once you get it a little bit loose, just run the prying tool down the length of each side. There's no adhesive on the ends. You should be able to work the top off by rocking it back and forth - it'll take a little bit of force but don't do it too hard or you might yank out the wiring inside the housing. Now you can see what you're getting for the extra $58.01! The black housing, two 4-pin XLR connectors, a circuit board, and some minimal wiring. These little spade connectors slide out pretty easily. Just remember which one goes to red and which one goes to black - both of my wires were black, and both of the connector pieces were red! ...and push the housing back down over it. I'd suggest rocking it on so that one end goes down first, then the other will follow. It won't snap into place but will be pretty snug even without adhesive. So anybody know if you can replace a dead 6v with a 12v, and still use the same circuitry/xlr port? Still talking about a BP-50 here. 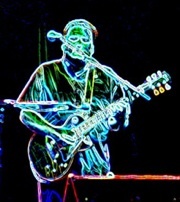 What about wiring up a Y cable to attach two BP-50's in series and output 12v? What's a safe way to do that? Put any fuses in the cable? Or just wire black to red and be done with it? Almost 10 years later, but still helpful!!! 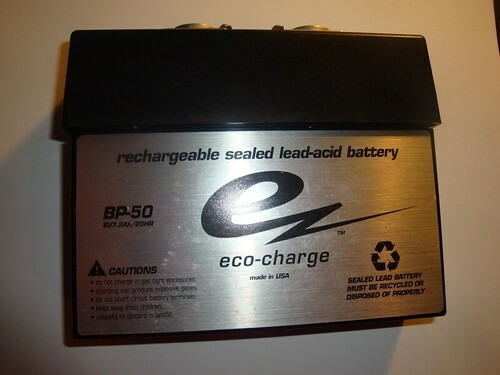 Just replaced one from some old Ecocharge BP50 that I’ve had since about 2002 or so. I was having a heck of a time getting the top off until I used a hammer on the short side sections to tap lightly and break the seal. The long edges pried apart pretty easily. Great advice - I was having trouble getting the top off a couple of my old BP-50's as well. As noted, I pried the top loose from the battery along the two long edges with a putty knife and I then gently clamped the battery in a vice (be careful not to clamp so hard you crack the sealed battery case) and I whacked the short edges with a hammer, placing a block of wood along the lip so I hit the wood with the hammer instead of the battery top edge. 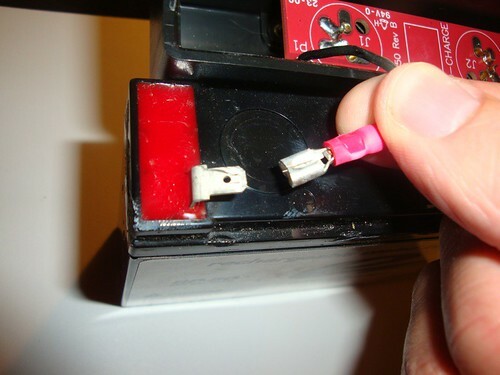 Once I did this, it popped right off on both of my batteries. Now I just need to find replacement batteries and I'll be back in action. 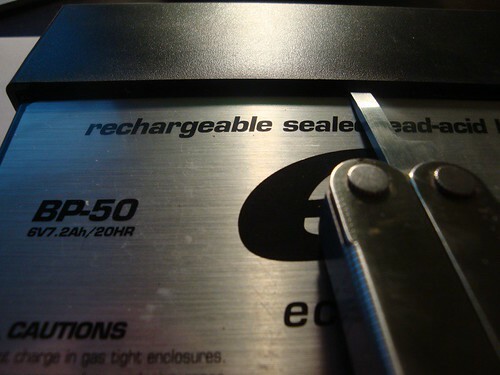 I also have a GP-90 I'm going to try - different size battery since it is 12v but I'm assuming it will come off as well. this thread makes my back hurt!